Once upon a time, from 1926 – 1933, on a non-descript street corner in Berlin there was a glamorous transvestite cabaret. ELDORADO was the place to be seen for everyone who was anyone in pre WWII Berlin. It was there that an unknown beauty who performed regularly was discovered and became Marlene Dietrich. Today it is a popular supermarket. Marlene Dietrich’s signature song “Falling in Love Again (Can’t Help It)” is a tune every German knows, or kind of knows. 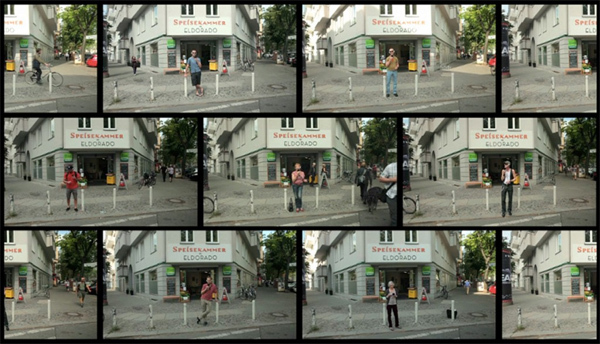 Here the artist has asked random people passing by the intersection of Motzstrasse and Kalckreuthstrasse – site of ELDORADO – to sing the song. The strangers perform a familiar tune, and a cover is born. The duration of the video is 02:57, the length of the original pop song. Each performer wears headphones and sings along with Marlene Dietrich’s original version transmitted with an iPod.